One of the best things about being a musician during the holiday season is playing music from all over the world and with many different background stories. There are some songs that clearly belong to a particular country, but then there are others that many nations have borrowed (or stolen) to make their own…all in good cheer, of course. Today’s featured carol is international in its history and the tune has been used for many, many songs on many different occasions. If you love Christmas trees, then today’s song might be one of your favorite holiday carols. In America, Christmas Trees (or Holiday Trees, if you want to be politically correct) are popular festive symbols. Whether you bring a real or artificial one into your home or just enjoy the ones at the malls and other public places, it’s almost guaranteed that you’ll see a Christmas tree at some point in December. So where did Christmas trees come from? Short answer: Germany. Way back when (think Roman Empire Era and Dark Ages), the pagan Germanic tribes worshipped certain trees and featured them in religious ceremonies by decorating their “holy” places and homes with nature. When the Christmas tree became popular again, it left behind the pagan connotation. Decorated in German and used to display gifts, the tree idea made its way to England with Queen Victoria’s influence (1840-1850-ish). The queen’s husband – Prince Albert – was German; together they brought the Christmas tree decoration to their palace. Since the royal couple were fashionable trend setters the idea became popular. America didn’t like to be too far behind England’s lead in fashion. Godey’s Ladies Book published an engraving of a Christmas tree decorated with candles, little ornaments, and gifts for the children. Christmas trees had become a symbol of beauty and fun, generally associated with children’s wonder in the holiday season. The famous carol known as “O Christmas Tree” was first published in 1824, but it wasn’t about Christmas trees! 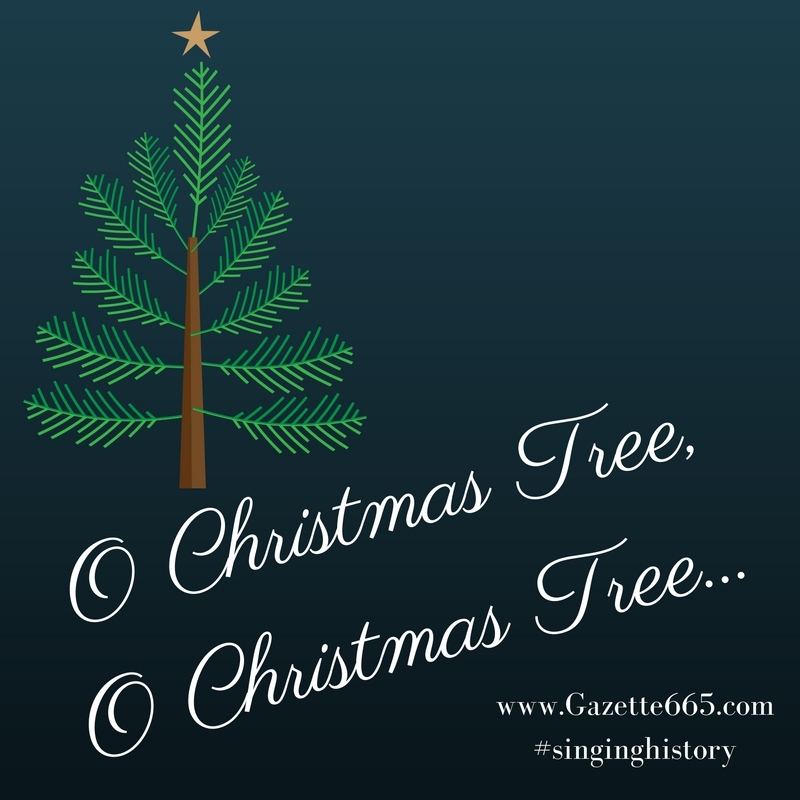 The original lyrics by Ernst Anshutz used the evergreen tree to emphasize themes of constancy and faithfulness through hardships. It was loosely based on a Silesian folk song. Not until the early 20th Century did the song become associated with a traditional Christmas Tree; the lyrics have been altered through the decades. The tune of “O Christmas Tree” is not exclusive to the holiday song. Quite a few songs use the same music including state songs for Florida, Maryland, Michigan, and Iowa. (If you’re a fan of Civil War era music, you’ll recognize the tune for “Maryland, My Maryland”…and maybe be disturbed that you remember the lacking-holiday-cheer lyrics from the 1860’s). To think of you and then be gay [glad]. P.S. Do you have a favorite ornament on your tree? Or a favorite tree decorating story?